Three days after I published my previous blog post about using storytelling to elicit cognitive ease, I found a study that, at first glance, contradicted something I shared in that previous post. As I got to the third section of the post about how to use plot structure to engage people emotionally, I suggested that by making people feel things like curiosity and suspense, you could lull people into a state of cognitive ease, where their more emotional minds are guiding them. 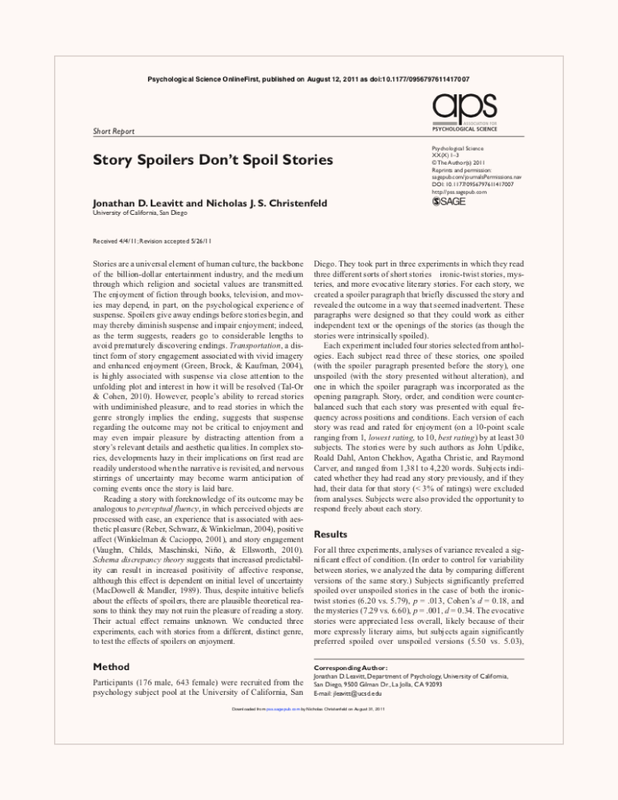 But this study from 2011 seemed to say the opposite: spoilers don’t spoil. The authors seemed to suggest that giving away the ending of a story at the beginning not only doesn’t spoil the experience, but may even make it more enjoyable. That’s because the more predictable a story, the more cognitive ease you feel. Well, as is normally the case with psychological matters, it’s not as simple as that. Let’s start by looking closer at the study that’s shaking up my post. First, I have to say I’m happy to see its methods were pretty decent. A large enough sample size is a must, as well as solid statistical results. I’d say it has pretty good internal validity. Check. But where it gets a bit hairy for me is in its external validity, or the extent to which results can be generalized. After all, results that come from a lab environment may be completely unrealistic to expect in a real life situation, if real life scenarios weren’t incorporated into the study. So did the study incorporate real life factors? Sort of. Let’s examine this further by looking at the type of spoiler they used, how anticipation affects engagement, and the reliability of self-report. There were two ways the study spoiled the stories given to participants. One way was to incorporate the spoiler seamlessly into the beginning of the story, so it was perceived as a natural part of the narrative. The second way was to give participants a separate summary paragraph which spoiled the ending, and then let them read the story immediately after. What the researchers found was that stories spoiled the second way, separately from the stories themselves, tended to be rated as more enjoyable by the readers than if they’d never been spoiled at all. Now, in some ways, that’s relatable to the real world. Usually when we encounter a spoiler, it’s separate from the story itself — it’s something we come by inadvertently on Facebook or through overhearing a conversation at happy hour. On the other hand, when we encounter a spoiler in real life, it’s usually not within mere seconds of consuming a story. Rather, the spoiler comes hours or sometimes days before the story, which may change the perceived impact compared to that in the lab. Not to mention, in real life, we are most affected by spoilers when we’re emotionally invested in the story to come. Someone who’s been waiting and waiting for a particular movie to come out is going to feel much more irritated by a spoiler than if it were for a story they didn’t care about much. Sometimes the anticipation of something is worth more than the actual thing. As found in this other study that looked at the effect of vacations on overall happiness, people tended to feel happiest while anticipating their vacation. Participants in the spoiler study weren’t put into “high and low anticipation groups” to be able to see the difference in enjoyment impact, and that limitation makes it harder to generalize the results. But there’s something else that may matter even more. In my post, I talked about how introducing a question in your plot that only gets answered down the line, can hook your audience emotionally and make them care more about the story more. That’s anticipation. And if studies show that anticipation can bring intrinsic enjoyment in itself, a spoiler should, in theory, lower this certain type of enjoyment—that is, if you like anticipation. I bet you know at least one person who hates surprises. Chances are, they’re not a big fan of suspenseful movies either. So while these types of conclusions may be statistically significant, they won’t apply to everyone. And the last thing I have to say on the matter is that self-report measures have been shown time and time again to be unreliable. From eye-witness testimony to studies of pain memory, people are not very good at verbalizing how they feel or what they remember. It’s a big reason why focus groups aren’t all that valuable. It’s not that people lie… it’s that their brains aren’t optimized for explaining emotion. It’s just biology. So if asking people how much they enjoyed a story isn’t as reliable as we’d like it to be, why did the researchers decide on that measure? I suspect it’s because that’s the easiest way to do it. Behavioral measures tend to be more reliable than self-report, which makes me wonder whether this study is really that relevant to storytelling approaches in everyday life. Just because someone believes something doesn’t necessarily mean they’ll act in a way that’s congruent with that belief. Take exercise, for example. Most people believe that exercise is good for them, but how many really follow through and make it a regular part of their life? In another (brilliant IMHO) study, participants were asked about their attitudes toward picking up litter. Of 506 pedestrians asked, 94% responded that it should be everyone’s responsibility to pick up litter when they see it. However, only 8 of them (1.4%) actually picked up the piece of crumpled newspaper that had been planted by the researchers near a tipped over trashcan. In short, how people feel and how people say they feel may not really matter that much in the end. What matters is what they do. So back to my original question, which one is true? Well, my answer to you is that it’s context-specific. While experiments in lab settings are meant to try to predict human behavior in the greater context of the world, they’re not always realistic enough to generalize. Does suspense work with all people? Well, probably not those who hate suspense. Then again, I wonder what would happen if you looked at the behaviors of those who claim to hate suspense to see if those behaviors are congruent with their reported discomfort. Without testing it, we can only assume it doesn’t work on them. But maybe, in reality, it works better on them than anyone else, because they feel the suspense more. That that is precisely why I love this discipline. There’s always something new to discover and countless interesting challenges in finding the best way to test these theories. Did you read to the end of this page? Did the plot structure of this blog post subconsciously pull you in? Did the subtle suspense of waiting for the answer keep you engaged up ‘till now?